I was fairly certain the world wouldn’t end today, and here we are. Sorry Mayans, you can join the ranks of the rest wrong in predicting the end of the world. Once again, I’m pushing Friday Flix to another time. Christmastime is a little hectic and finding enough time to watch a movie just hasn’t happened. True, I could review one I’ve already seen, but I like to watch or re-watch the movie to pick up on the subtleties and storytelling elements they did well (or poorly). On to the topic at hand. Christmas! There are lots of cities that celebrate Christmas in unique and fantastic ways. I’d love to visit New York sometime during the Christmas season and see all the fabulous displays. I’d especially love to visit FAO Schwartz. I can only imagine what awesomeness would be on display there. But I’m talking about my own backyard. I’m talking about Christmas here in good ol’ Salt Lake City. If you come at Christmastime and ask your hotel concierge about things to do, they’re more than likely going to suggest a visit to Temple Square. This area is one of the original sites built by Mormon pioneers, home to the Salt Lake Temple (the castle-looking building) the tabernacle of Mormon Tabernacle Choir fame, as well as a few visitors centers, and an old cathedral-looking building called the Assembly Hall (boring name, I know…). This whole area is enclosed by walls on a square block of the city, but there are also sights to be seen surrounding the block. Nearby the Mormon Church History Museum often displays nativities from around the world. I believe many of these nativities are sent in by Mormons from many foreign countries. Also nearby is the Mormon Conference Center, a Death Star of conference centers, built in 2000 when the Tabernacle’s seating capabilities had grown beyond ridiculous for how many people they needed to accommodate. Now several events are held in the center, including the Mormon Tabernacle Choir’s Christmas concerts—the one this year featured Alfie Boe and Tom Brokaw. It holds 21,000 as opposed to the Tabernacle’s meager 5,000. But the Tabernacle still hosts many festive events throughout the season, even on New Year’s Eve. Also at the Conference Center during Christmastime is a play called “Savior of the World” which starts with Mary and Joseph’s beginnings in the first half and scenes of Jesus’ life in the latter half. East of Temple Square is the Main Street Plaza, which might still be considered part of Temple Square—but the point is more lights. They have this huge reflecting pool where you can see the Temple, but they also place a nativity in the center of the pool with a bunch of floating lights. It’s pretty majestic. If you head even more easterly past the pool, you can see a dozen or so large nativities representing different countries, like Mexico, Japan, Africa, and others. They also have luminaries with Christmas greetings in dozens of different languages. And Temple Square itself? Lights! Lights! LIGHTS! Everywhere you look you’ll see thousands if not close to a million lights. There’s also a nativity scene reminiscent of the old style Pirates of the Caribbean ride at Disneyland, but simpler, with lights shining on different parts of the scenes. It’s a little outdated, but we still enjoy it. Around Christmastime they allow people to tour the Governor’s mansion, something built in 1902 and for the most part well-preserved to this day. Of course they deck it out with Christmas decorations and magnificent trees. There was even a gingerbread replica of the mansion in one of the rooms. This is some serious poshness. I guess the original owner discovered a silver mine and cha-ching. If you’re ever in Utah during this time, you should check it out. Macy’s took over the old ZCMI building, a department store started in Utah in 1868—although the building itself wasn’t built until 1910. Anyways, Macy’s does Christmas window displays, and the City Creek area is decked out in the spirit of Christmas (though not quite as significantly as Temple Square). Utah’s Hogle Zoo didn’t want to be left out of the Christmas fun, so they host a Zoo Lights event every year from Dec. 1 – Dec. 31. I haven’t been myself (as I’m not the biggest fan of visiting zoos in cold temperatures) but check out the displays. We have another downtown mall called the Gateway where you can see even more Christmas lights, but these are choreographed to music and the Olympic fountain built during—you guessed it—the Olympics. 600,000 lights you can see there. And get some shopping done to boot. I was a little weirded out when I first saw this, but apparently we have a Jingle Bus now. You can ride the bus between the two shopping centers AND see the lights all for free. Woot! I love Thanksgiving Point for the tulips festival they hold in April, but they too do Christmas right. Okay, it’s not exactly in Salt Lake, but it’s something you can enjoy from the warm comfort of your car. A million lights, lots of trees, and some animated display. It’s almost like we’re all trying to compete with each other as to who is the most Christmas-y. Well, that or maybe some people don’t want to make the drive up to Temple Square. A lot of people live in the southern Utah Valley and enjoy their Christmas as much as us Salt Lakers do. There are loads of houses that deck themselves out for Christmas. The trouble is finding them. I may have to do a future post collecting the approximate locations of these displays. The BFF and I usually just stumble onto them. One year we heard about a guy whom I believe had 100 inflatable Christmas displays. It was quite the impressive show. But the creme de la creme of all these private displays was none other than Christmas Utah. A tradition started in 2006, humble light enthusiast Marty Slack probably had no idea what he was getting into when he put together Christmas Utah. He even made it onto CBS Morning news. Marty had hundreds of lights choreographed to music, each display unique to its song. I think the whole show running was about 15 minutes, then would just start over. You could tune into his short wave radio station, park your car and watch the show. In 2011 he announced his retirement. I guess he pretty much had to stick around every Christmas and make sure the lights were okay. We were all super sad, as it’s been a part of our Christmas for 5 years. It was one of the best parts. Then this year I was missing Christmas Utah and happened to click on the site to watch old videos when I got the best news EVER! 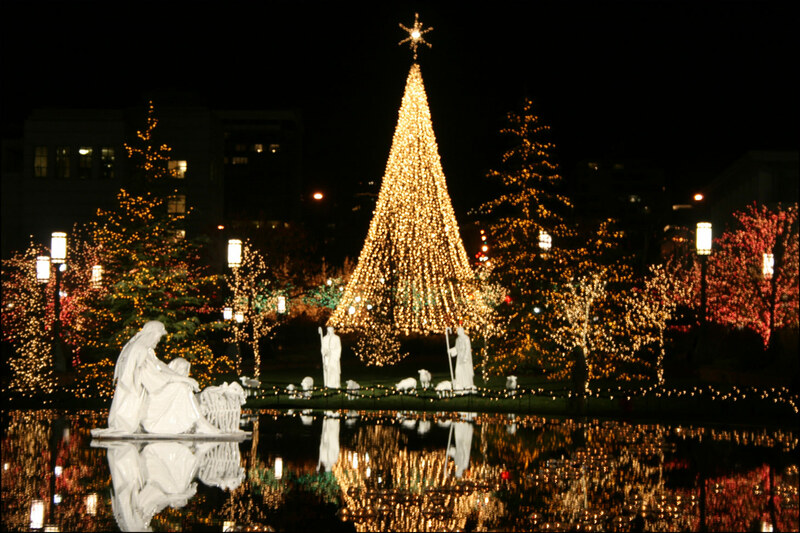 There’s the Festival of Trees, The Wesley Bell Ringers, Handel’s Messiah, Dicken’s Christmas Village—so many events that go on here in good ol’ SLC. If you ever need a place to stay during the holidays, if you can handle some winter chill, this may be the place for you. Plus we have skiing—lots of skiing. Anyway, I hope you all have a Merry Christmas! I’m heading up to the slopes today and perhaps tonight if we’re not too frozen, check out some of the downtown lights again. Also, no posts Monday or Tuesday. I’m taking a Christmas break. Does your town do Christmas right? What kinds of displays do you have in your area? Or is it a little more bah-humbug than you’d like. Let me know either way in the comments below.